The same error message came when I tried to logon to other servers in the domain. So what does the trick to fix this? 2. when logged into the server, check that services that supposed to be started are started. — as you noted when you did the logon, you got into safe mode… strange? yes..
3. So, hit the “WIN + R” and type “MSCONFIG” 4. navigate to the “Boot” menu, and remove the “Safe boot – Boot options” hit Apply and restart your server. Sometimes (not often i hope) you want to exclude updates for somehow that you are deploying to all your computers with System Center Configuration Manager 2012. 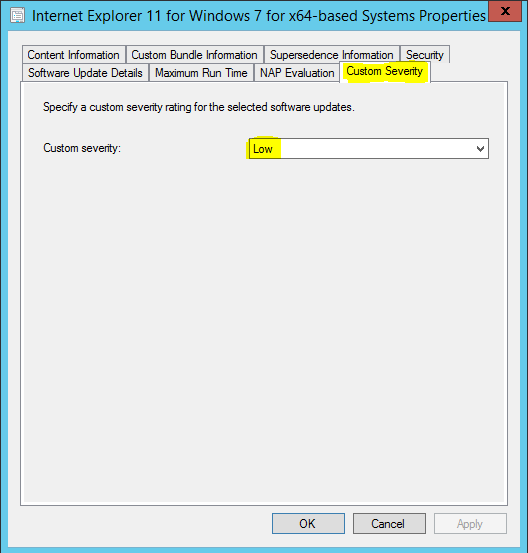 The excluding of Windows updates can be done with some few steps. With this the next time the ADR is running it will distribute only the updates that does not have any “Custom Severity” defined on them, all updates that are to be distributed every month comes with none custom severity and therefore you will not send out the one that you change severity of.